Yesterday while I was rearranging my audio CDs, I came across an old anime favorite (Hayao Miyazaki’s My Neighbor Totoro) that got mixed up in the pile by mistake. Without further ado, I popped it into my player. As the familiar strains of the upbeat opening song wafted into my tiny living room, I found myself sliding into this mellow, nostalgic mood that automatically kicks in when I’m watching something that I really like. 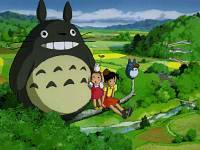 Among Miyazaki’s animated films, I’ve always found My Neighbor Totoro (1988) far easier to relate to because, notwithstanding the supernatural element of of old forest spirits, the story is essentially grounded in reality (and roughly autobiographical on Miyazaki’s part, according to some) and takes place in a sleepy rural setting. Also, it’s not particularly violent, which should make this animated feature fairly suitable even to young children. Basically, it’s one anime title that I’d be pleased to recommend to anyone regardless of his/her age. 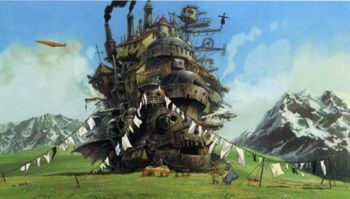 Without giving away the rest of the story, there are several items in this film that should be fairly obvious to a Miyazaki enthusiast. 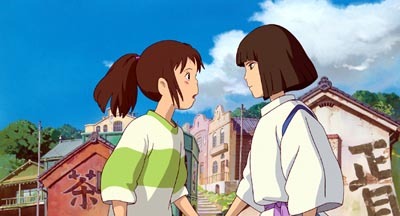 The main protagonist is a young girl (or in the case, girls) who’s learning to grapple with the complexities of life (a resurring theme in many Studio Ghibli films such as Spirited Away, Kiki’s Delivery Service, Laputa Castle, Porco Rossi, etc.). There’s also an endearingly clumsy young boy, Kanta, who shows an abiding interest in planes/aviation (Kiki’s Delivery Service, Laputa Castle, Porco Rossi), a trait that Miyazaki shared as a child. This movie likewise emphasizes, in unobtrusive but touching intances, the way the Japanese show respect for their old and the ‘natural’ spirits around them. I don’t know how much of what is shown in My Neighbor Totoro actually reflects Miyazaki’s childhood, but I’ve read somewhere that he was quite close to his grandmother and that his mother has also suffered from a serious ailment which required a lengthy hospital treatment. He’s known to care deeply for his female relations and I think it shows in the way he presents his female characters. 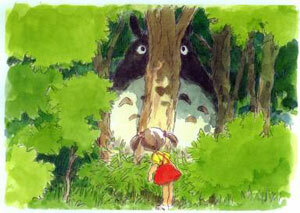 My Neighbor Totoro still ranks (and will undoubtedly remain) as one of my top 10 anime favorites. 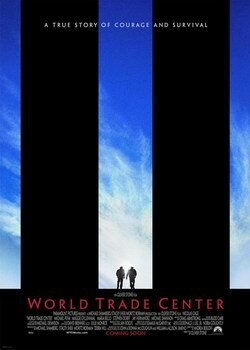 As we wait for Oliver Stone’s World Trade Center to hit the local theaters (almost 5 years after the event), I am reminded of another 9/11 movie that was shown about 2 months ago. 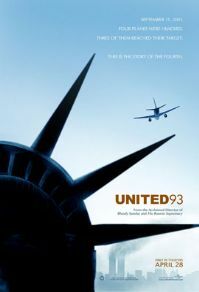 United 93, helmed by British director Paul Greengrass (The Bourne Supremacy, Bloody Sunday), is a chilling, no-nonsense account of what transpired during its fateful flight. The San Francisco-bound 757, through the courageous act of its crew and passengers, was the only (out of four) flight that was able to thwart its captors’ grim intent of turning planes into hurtling missiles. The film, which features little-known actors and real-life personalities (who are playing themselves in the movie) as well as airline and military personnel, was shown to the public with little bombastic fanfare that usually accompany big-budget Hollywood movies — perhaps a more fitting and more respectful tribute to the plucky crew and passengers of U93, who were unwittingly thrust into the ghastly business of grappling with terrorists while everybody else was still struggling to understand the magnitude of that day’s horrifying events. My friends and I had planned to watch a different movie (at the time I had no firm idea about U93’s play date) but when I saw U93 was on, I knew this was one movie I needed to watch. With all that’s going on these days (e.g., the failed terror plot in UK, unfinished business in Afghanistan, Iraq, Lebanon, etc. ), U93 — which runs like a documentary — hardly offers its viewers an opportunity for closure. But like everybody else, I was curious to see what directors would do to cover the ghastly events of that day. Greengrass’ spare, no-nonsense approach offers no sugarcoating nor does it attempt to milk blatantly sentimental, cinematic or righteous mileage out of the movie’s grim subject. The cast was effective and the story inescapably gripping. Another notable point (which made the whole thing more potent as far as I am concerned) was the way both sides were presented: the desperate passengers and the frantic hijackers locked in a deadly battle to wrench control of the plane — and with that the chance to survive or to die for a reprehensible cause. Shots of terrified crew and passengers (praying, saying their goodbyes, crying, hatching plans to fight back) are interlaced with glimpses of anxious hijackers uttering fervent invocations as they struggle to bring their plans into fruition. It’s also interesting to note that, based on RottenTomatoes‘ tomatometer, U93 scored well among film critics (92%), with a few declaring U93 as one of the best features they seen so far this year (2006). Although some critics haven’t checked in yet, WTC‘s rating is pegged at 71%. The relentless coverage of the ongoing Israeli-Hezbollah conflict in the Middle East has breached a new level when Reuters announced on Aug. 7, 2006 that it had removed a ‘doctored’ photograph that was recently filed by Adnan Hajj (a Lebanese freelance photographer), after its staff had ascertained that the photo had been digitally enhanced (via Photoshop). The photo (check this out), which shows thicker smoke in sharper contrast compared to an unedited snapshot, ’emphasized’ the devastating impact of Israeli aerial bombing in suburban Beirut. The news agency, which removed all (920) of Hajj’s photos from its archives as a precaution, also announced that it had terminated its ties with the Beirut-based freelancer after determining that another picture (of an Israeli F-16 fighter dispensing flares) showed unmistakable signs of ‘tampering’. According to the Reuters spokesperson, Hajj, who denies of any wilful wrongdoing, insisted that he was only trying to remove the dust marks, and committed mistakes due to less-than-ideal lighting conditions. While this ‘digital tampering’ (which the news agency specifically forbids) seems hardly the main issue in this tragic conflict, it has thrown into sharper focus some of the convenient photo ops that have been stage-managed by Lebanese and Hezbollah authorities for the international media so far. On-line bloggers who made the first sound alert on Hajj’s “edited” photographs (see LGF’s page for a more interesting discussion on this issue) were also quick to point out a few interesting details in some of Hajj’s recent pictures. This is not to say that Israel itself isn’t above showing favorable footages to promote its case in the international arena, but noticeable lapses such as these crude attempts at media manipulation aren’t exactly helpful to the Lebanese victims either, or for the matter Hezbollah’s cause. i have been embroiled in this affair for far more years than i’d care to count, but there it is. the truth is, i’d much prefer to watch an anime feature over a certified hit sitcom (with very few exceptions). as blasphemous as that sounds to other tv viewers, i would rather sit through hours of anime re-runs (as long as they’re my favorites) than go through episodes of Alias, Smallville, or even CSI. out of the 30 – 40 titles (tv series, OVAs/OAVs, full-length movies; it could be more though; i stopped counting when i reached my 20th), i have already drawn up my list of favorites. actually this list keeps on expanding and modifying itslef as more titles become available in the market. 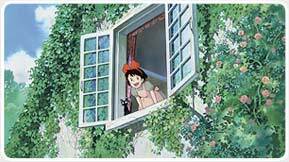 however, i’ll have to admit that quite a lot of my all-time favorites include some of hayao miyazaki‘s best works. as far as i’m concerned, he is the gold standard against which others can only hope to aspire to. i just wish i knew enough japanese to watch some of these titles in their original format. for some reasons it just feels and sounds different when japanese seiyu say the lines. foreign voice talents (including a number of established hollywood names) can sometimes reach or occasionally even surpass their level in terms of bringing certain characters into life, but for my money the japs have it. not that i’d mind watching the english version though … whatever version is fine with me as long its a good one.